I would like to put a request in for KSMF Sacramento International. It is freeware produced by David Biggar at V1 Simulations. Hello! 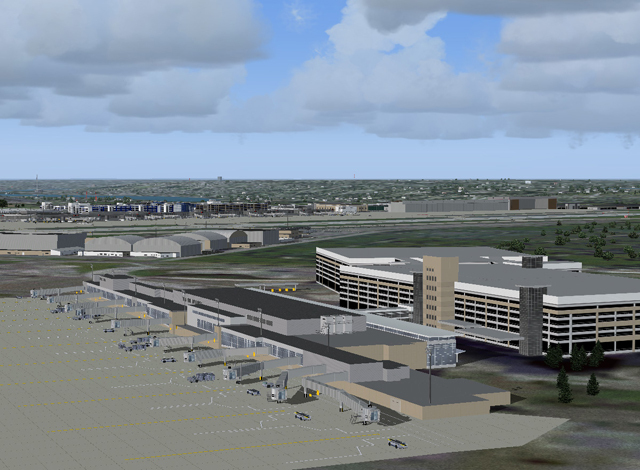 I was Wondering if you could add 2 Canadian airports to AES. Montreal CYUL Tudeau Int. I know theres a Blueprint FSX version and that whole conflict blah blah blah... but if some miracle comes and they change their mind. Second one is Vancouver International CYVR by FSaddon! called VancouverPlus for FSX . No AES: CYVR is not part of this Addon, Airport still default. I make no default Airports at the moment. I was wondering if you can make this update aes compatible of a new terminal made by indoflyer.net for Budi Santoso's Juanda Scenery. It can be downloaded from their website: www.indoflyer.net or from Flightsim.com. no AES: Developer uses same LAT/LON of Areaheader for all object, jetway not seperate excludable. I would like to request the RJGG airport for fs2004 made by Mitsuya Hamaguchi and can be downlaoded from http://www.flightsim.com/. If you need to get in contact with the author I can give you his mail if needed. There are a great community in Norway and a good market for your product. To me that was possible to APP and landing airport in the famous St ª. Maarten, without having to make flights of 7 hours (here in Europe) decided to work for some companies Venezuelan !!! Therefore, Scenarios for the purchase and SAEZ SVMI of http://www.blueprint...ies/SVMIFS9.htm, because this way the flights are much shorter (1:25)! But until that happens today, not yet added any airport or from Venezuela, and Argentina to the AES. In conclusion, it is possible to add at least Caracas (Maiquetia), in its spectacular program was extraordinary. Any chance of installing AES to the Southwest Design Newquay airport please ? Just tried AES 2.03 and love it for FSX. Is there any plan/option to offer it for default FSX airports? Not just Aerosoft's and other add-on airports? Thanks! I would like Blueprint Simulations KMSP (Minneapolis St Paul Intl) in Minneasota to have AES. Then it would have 2 gates to pull up to all my A380s i have. It's a little old scenery, I know... But I always try to find airports I have been to in real life. And I only fly to AES airports... I stopped over here for 30 minutes last month from LaGuardia to LAX on an AirTran flight. I hope the technique of the scenery files are not too old... Hopefully, they are still around to be contacted. I'd like to request DREAMSCENERY - INDIANAPOLIS INTERNATIONAL AIRPORT KIND X. Would be great having a nice AES compatible version of KIND to go along with US Cities Indianapolis, since blueprint doesn't want theirs done. Great scenery, very detailed, and also was the top download for avsim for a month. It really deserves AES, the author put a lot of effort into his work. Please add AES to GodZone airport sceneries. What do you think Oliver? Airport: Florianópolis - Hercílio Luz Airport (SBFL-FLN) and Florianópolis Air Base.